Until the release of Cataclysm, the shrine made a reference to Dath'Remar's supposed valiance during the Scourge invasion. It is unknown why, since Dath'Remar was long dead during the invasion; Anasterian Sunstrider was the king of Quel'Thalas who fought the undead legions directly during that time. 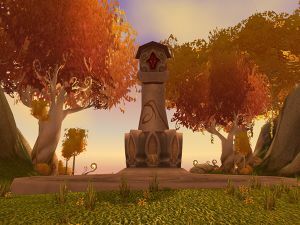 Many new blood elf players have a hard time finding this shrine, so a few players have dubbed it "Shrine of Mankrik's Wife". This is less of a problem after patch 5.0.4, which marked the shrine on the newly added map of Sunstrider Isle. 补丁 4.0.3a (2010-11-23): The shrine now conveys a more broad description of Dath'Remar and no longer references the Scourge.